Irish War Cry cruised to win the Grade 3 Pimlico Special. Photo by Dottie Miller. Irish War Cry is a four-time stakes winner of $1,257,060 and raced from 2 to 4 for his breeder Isabelle de Tomas. He launched his career with three straight victories, including the Marylander Stakes at Laurel to complete his juvenile season, and the Grade 2 Holy Bull at Gulfstream Park to kick off his 3-year-old campaign, earning the first of five triple-digit Beyer Speed Figures with a front-running performance. It was his first two-turn attempt and he completed the mile and a sixteenth in 1:42.52. That effort launched him to the top of the NTRA’s leading 3-year-olds poll, and he went into the Kentucky Derby-G1 as one of the favorites off a smart, three and a half-length score in the Grade 2 Wood Memorial Stakes at Aqueduct. Although off the board in the Derby, he was the favorite in the Belmont Stakes-G1 and led the majority of the mile and a half classic, battling gamely to the wire with Tapwrit to finish second. 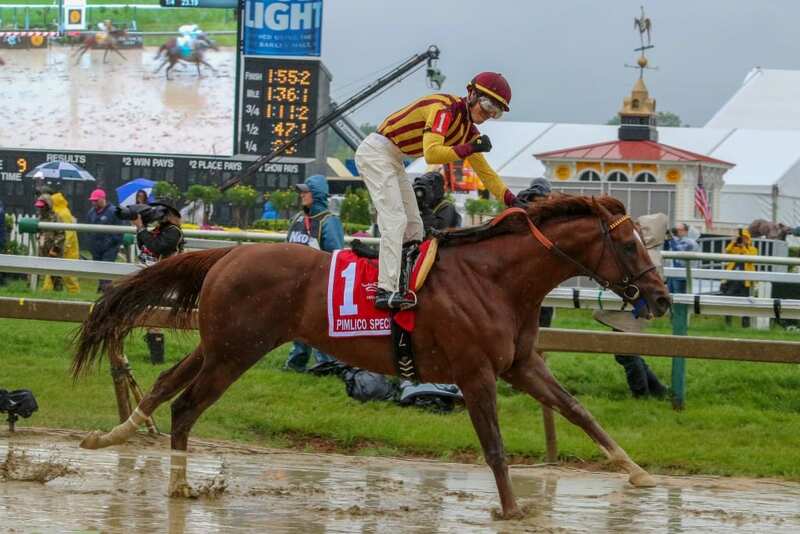 The chestnut colt returned at four to capture the Grade 3 Pimlico Special, leading at every call and drawing off by four and a half lengths over a sloppy track in 1:55.51 for the mile and three-sixteenths. Irish War Cry is one of six winners from as many starters for the Polish Numbers mare Irish Sovereign. He is a half-brother to graded stakes winner Irish Strait and stakes-placed Irish Politics. Stud fee? I guess $10,000.